Luxury hotel operator Fairmont Hotels & Resorts and Mota-Engil Tourismo today announced the development of a new 250-room luxury hotel and additional private residences along the Riviera Nayarit in Mexico. The sparkling new Fairmont Costa Canuva is slated to open in late 2018 and will reside within the new master-planned seaside community, “COSTA CANUVA”, on the Riviera Nayarit. The Costa Canuva development is set along miles of pristine beach, just north of Punta Mita and approximately 40 miles north of Puerto Vallarta International Airport. Costa Canuva, with more than 4.3 miles of shoreline and 630 acres of beach, estuary and mountains, will offer five hotels, including the Fairmont, and will be ideal for all types of travelers. It will also present residential ownership opportunities within the beachfront village with 2,500 residential units, including some designed by the renowned Artigas Arquitectos firm. The development will also have an exclusive golf course designed by Greg Norman and Lorena Ochoa, with this being the first course created by the Mexican golfing champion. 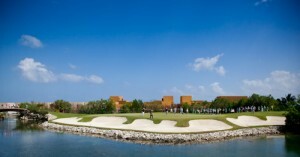 Two of the holes will present spectacular sea views to guarantee an unforgettable playing experience. Furthermore, an extensive list of activities will be available at Costa Canuva. Families will be able to experience a blend of sea and mountain and enjoy paddle surfing, more than 20 kilometers of cycling tracks designed by the International Mountain Bicycling Association (IMBA), and a canopy park including ziplines, among others. These will come together as part of a masterful design to respect and enjoy the beauty and luxury of the venue, as is a tradition in projects overseen by famed urban planner, Mario Lazo. The Riviera Nayarit stretches for 51,800 hectares along the Pacific Ocean and offers a coastal lifestyle similar to that of California, while sharing the same latitude as Hawaii, providing a temperate yet tropical climate that can be enjoyed all 365 days of the year. Costa Canuva will provide access to sailing, surfing, fishing expeditions, a PGA-level golf course and pristine beaches. It will also add to the offering that led Condé Nast Traveller UK to name the Riviera Nayarit as one of its 10 Destinations To Watch in 2015. Fairmont Costa Canuva will join its sister property, Fairmont Mayakoba located in the Riviera Maya region, and expand Fairmont’s growing portfolio of highly sought after luxury vacation resorts around the world. The Fairmont Costa Canuva will also feature Fairmont-branded residences for those who wish to make their stay in Mexico more permanent. As primary dwellings or getaway retreats, these whole and fractional ownership homes can be enjoyed all year long and will become a legacy for generations to come. The development of the Costa Canuva village represents a $1.8 billion USD investment in the region’s economy and is expected to create 6,000 direct jobs and 18,000 thousand indirect jobs locally. The project is being spearheaded by Portugal’s Mota-Engil, one of the largest construction and infrastructure management companies in Europe and the only Portuguese company in the World’s Top 100 Construction Companies, according to Engineering News-Record. Fairmont Costa Canuva will feature 250 guestrooms and suites, including 40 Fairmont Gold rooms and Fairmont branded residences. It will also boast more than 22,000 square feet of meeting and event space, six restaurants and bars, an expansive outdoor swimming pool and a spectacular Willow Stream Spa encompassing nearly 13,000 square feet. A center for children and young adults, providing creative and active activities, will appeal to holidaying families. As well as attracting luxury travelers and adventurous sun-seekers, the Fairmont Costa Canuva will benefit from its close proximity to the Sanctuary Convention Center, making it an ideal venue for corporate groups, conferences and social events. Fairmont Hotels & Resorts connects guests to the very best of its destinations, providing travelers with memorable travel experiences, thoughtful and attentive service and luxury hotels that are truly unforgettable. Each Fairmont property reflects the locale’s energy, culture and history through locally inspired cuisine, spirited bars and lounges and distinctive design and decor. With more than 70 hotels globally, and many more in development, the Fairmont collection boasts some of the most iconic hotels in the world, including The Plaza in New York, The Savoy in London, Fairmont Peace Hotel in Shanghai and Fairmont Le Château Frontenac in Québec City. Fairmont is owned by FRHI Hotels & Resorts, a leading global hotel company that operates more than 130 hotels and branded residential properties under the Raffles, Fairmont and Swissôtel brands. For more information or reservations, please visit www.fairmont.com. The Mota-Engil group has flourished over the last 70 years, marked by a culture of entrepreneurship and innovation in its ongoing quest for new horizons. Mota-Engil is a multinational and diversified business group with highly recognized know-how throughout the construction and infrastructure management value chain. As a leader in Portugal and ranked among the 30 most important European companies in the construction sector, Mota-Engil is present in 3 continents and 22 countries across Europe, Africa and Latin America. It participates in more than 200 companies around the world while maintaining the same standards of rigor, quality and capacity that have distinguished it throughout its history. Situated at the southernmost tip of the Baja Peninsula and home to Mexico’s most top-shelf golf offerings, Los Cabos has established itself as a coveted, world-class golf getaway over the past two decades; and now with the announcement of three new courses on the horizon Los Cabos will continue to rise above the rest. Boasting nearly a dozen courses designed by the game’s leading architects, Los Cabos commands a unique ocean-mountain-desert ecosystem found nowhere else in the hemisphere. This unusual combination of environments has sparked the imagination of developers-and resulted in the creation of the “Next Great Place” for international golf travelers. Home to four of the top five courses in Mexico according to Golf Digest’s current ‘Planet Golf’ rankings, Los Cabos plans to raise the stakes in 2014, when the two best-known figures in the sport, Tiger Woods and Jack Nicklaus, will unveil new creations at Diamante and Quivira, respectively. Closer at hand, Chileno Bay, a long-awaited resort development fronting one of the most desirable beaches in Los Cabos, will debut its dazzling Tom Fazio-designed course on December 31, 2013. Routed in desert foothills high above the Sea of Cortes, each hole on this beautiful newcomer has graceful, flowing landforms intended to simulate rolling ocean waves. Framed by sculpted bunkers, broad arroyos and feathery “champagne grass,” Chileno Bay builds to a climax at the long par-4 18th, which tumbles downhill to a sprawling green back dropped by the sea. Diamante, a timeshare development built on massive sand dunes above the Pacific Ocean a few miles north of Cabo San Lucas, simulates the sensation of playing a treeless, windswept, Scottish-style links. As an added attraction, golfers can view whales breaching close to shore during the winter months. Diamante’s top-rated Dunes Course, designed by Davis Love III, offers tee times to prospective property buyers. Love and his design team recently returned to Diamante to replace the inland 12th and 13th holes with a new pair of holes routed in enormous dunes nearer the sea. These holes will debut in mid-2014. Later next year the Dunes Course will be joined by El Cardonal, an inland layout with an “Old California” design motif that will mark the architectural debut of superstar Tiger Woods. Adjacent to Diamante at the Pueblo Bonito development is Quivira, a breathtaking layout by Jack Nicklaus that starts at sea level near the pounding surf before climbing to higher ground, where the panoramic views and topographical diversity are unsurpassed. “Our team is working with the canvas Mother Nature has provided to create one of the most spectacular courses in the world,” Nicklaus said of his sixth and perhaps final course in Los Cabos. Marked by windswept dunes, steep cliffs and raw desert, Quivira has the potential to redefine the Cabo golf experience and is expected to rank among Nicklaus’s most memorable creations. The $40 million golf development at Quivira is tentatively scheduled to open in summer, 2014. 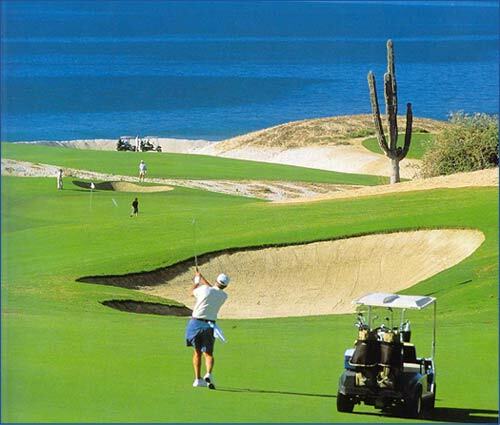 With its consistently sunny weather, low humidity and cooling sea breezes, the climate in Cabo is perfect for golf. The corridor’s scalloped coastline, washed by the Sea of Cortes, is home to more multi-starred, “gran turismo” hotels than any other destination in Mexico. In addition, the plethora of activities favored by golfers and non-golfers alike includes fishing (deep-sea and in-shore), surfing, sailing, snorkeling, scuba diving, windsurfing, whale watching cruises, desert jeep tours, exceptional shopping, eclectic dining, and dawn-to-dusk nightlife. Our old friend Anita Draycott was in Mazatlan recently with her husband for some golf and fun. Take a look what she has to say about this great, old Mexican port town that really has everything you would want – great beaches, golf, wonderful seafood, interesting history, stunning weather and sunsets, and some of the nicest locals in Mexico. And all for a fraction of the cost as some of the popular beach destinations.